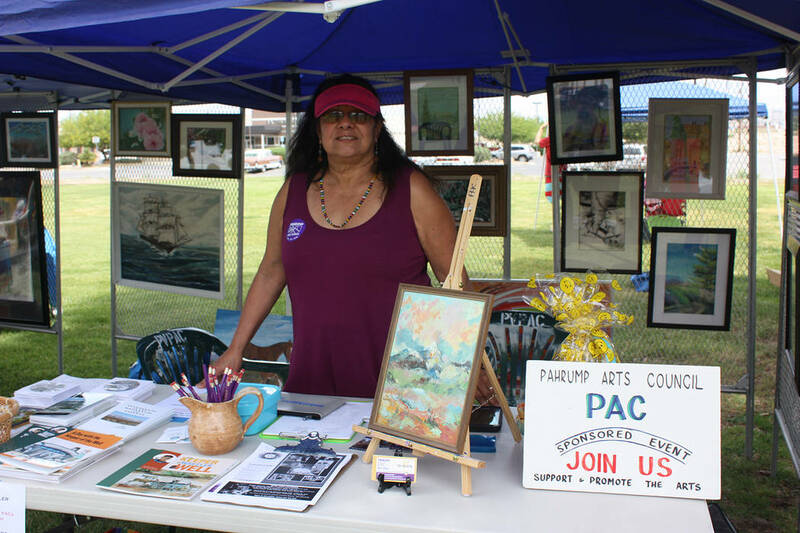 The Pahrump Arts Council’s 20th Annual Art and Sol Festival is set to fill Petrack Park with the wonder and beauty of creation and event organizers are encouraging the entire community to head out to immerse themselves in the artistic atmosphere. 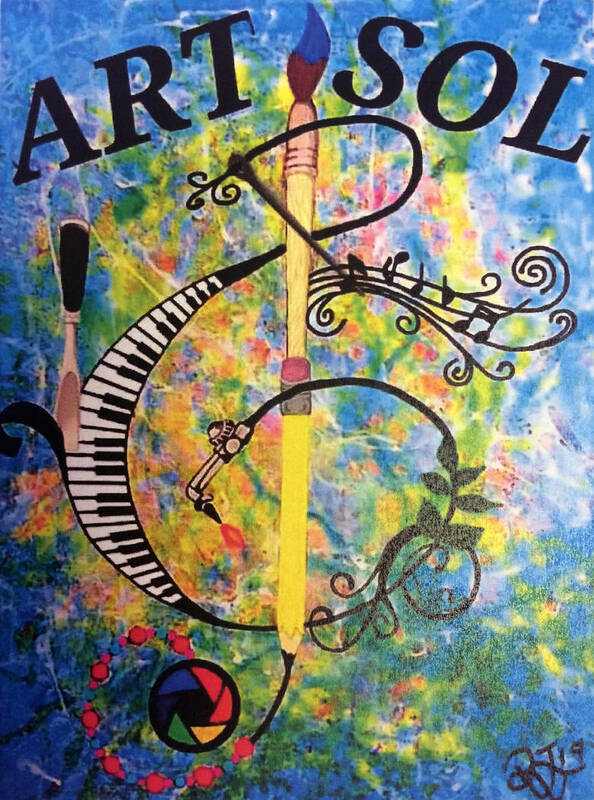 Robin Hebrock/Pahrump Valley Times Prominently featured on the flyer for the Art and Sol Festival is this logo, created by local artist Richayne Jenkins. Matted prints and postcards of the piece will be available for purchase at both the Spring in the Vineyard and Art and Sol Festival events. 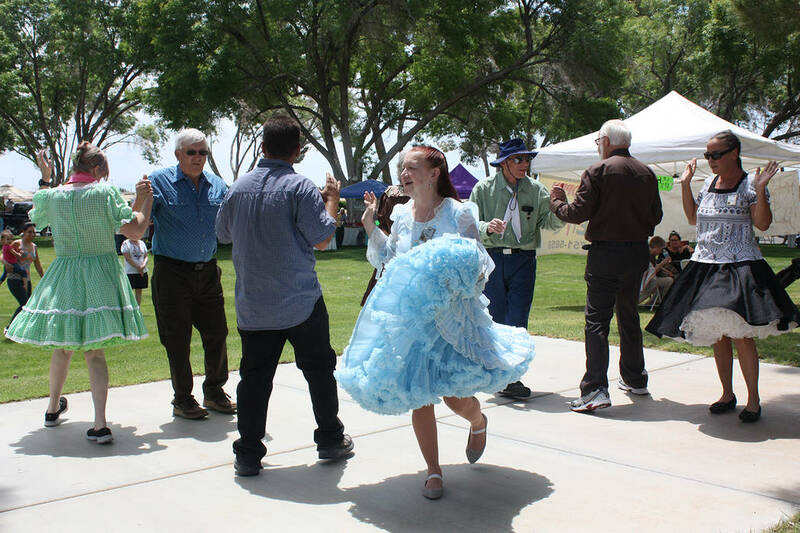 Robin Hebrock/Pahrump Valley Times The Desert Squares square dance group performed for the crowd at the 19th Annual Art and Sol Festival, hosted last year. This year's event is set for Apriil 13 at Petrack Park. Robin Hebrock/Pahrump Valley Times The Pahrump Arts Council's vendor booth at the Art and Sol Festival in 2018 had displays of artwork and lots of information on the nonprofit organization. Attendees of this year's event will also be able to purchase raffle tickets and goodies at the booth as well. Scheduled for 10 a.m. to 5 p.m. on Saturday, April 13, the Art and Sol Festival will bring together a massive array of area artists of all kinds. Attendees of the Art and Sol Festival will get a taste of the valley’s many and varied artistic talents, with vendor booths scattered throughout the park to display the work of Pahrump’s gifted and imaginative population. There will be plenty of live demonstrations to catch the attention too, including glass blowing, wax on glass and demos using “unicorn spit” techniques. The youngsters and those with a sweet tooth will likely want to spend some time with the cake and cookie decorating stations, where they will learn about beautifying the yummy treats before they get to gobble some down. Food will be a big focus of the festival as well, with the featured vendor the HUBB, which will be serving up burgers, mozzarella sticks, hot dogs and more. In addition, for the thirsty adult crowd, the HUBB will also have a beer garden. Joining the food vendors will also be Pete’s Meats and Treats and one of the valley’s newest eateries, the Tamale Place. The Pahrump Arts Council will also be selling popcorn, cotton candy, water and strawberry shortcake to ensure everyone’s appetite is assuaged. The Art and Sol Festival is about gathering the community to celebrate art, music, food and togetherness but there is another purpose behind the event, that of fundraising. The Pahrump Arts Council is a nonprofit organization dedicated to creating an environment in which the arts can thrive and one of its main goals is to ultimately open a performing arts and events center right here in town. “Our town is full of amazing and incredibly talented people who deserve a place to teach, learn, grow, perform, display and heal, a place where you and your family can come and enjoy classes, performances, weddings, receptions, conventions, birthdays, learn food and pastry art, a place where those with disabilities can be given a chance, with occupational therapists, to rebuild, replenish and find healing within themselves through art,” Pahrump Arts Council member Ginger Forbes explained with obvious passion. To this end, there will be many raffle prizes to tempt patrons of the Art and Sol Festival, with all raffle tickets to be sold at the Pahrump Arts Council’s booth during the event. All proceeds from the festival will go toward the council’s building fund. Anyone interested in signing up as an exhibitor at the event may contact Forbes at 801-390-3790. All registration forms must be submitted no later than April 8. For more information visit www.pvpac.org or contact the Pahrump Arts Council at 775-505-1362. 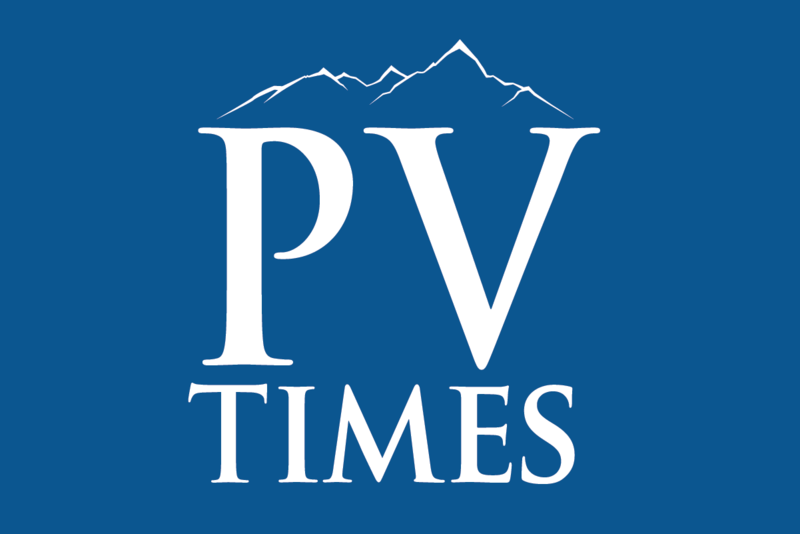 From 6 to 8 p.m. on Saturday, April 6 the Pahrump Arts Council will host its annual Spring in the Vineyard fundraiser at Sanders Family Winery. Along with wine tasting, there will be a spring-inspired appetizer buffet to complement the drinks, with the food prepared by Kristin Swan. The Pahrump Community Choir’s Quintet will be singing a small sample of what they will be performing during their May 3 event, Broadway with a Twist, and the string quartet the Minuetto Music Chamber Group will be playing. Pieces of artwork will be raffled off, along with various other high-end raffle items and the work of this year’s featured Art and Sol Festival logo artist, Richayne Jenkins, will be up for grabs too. Tickets for the print of the logo will be sold and there will be matted prints and postcards of the logo available for purchase. “She will be displaying her amazing creations for commissioned orders. She is an incredible lady and artist, we are so privileged to have her as a member of the Pahrump Arts Council and the Pahrump community,” arts council member Ginger Forbes detailed. Tickets to Spring in the Vineyard are $35 each and can be purchased online at www.pvpac.org or at the venue. All proceeds will go toward the arts council’s building fund.